New product announcement of A3 size flatbed UV inkjet printer, "Extra model"
Just one print setting can complete four steps of high-added value creation with primer application to clear surface treatment! 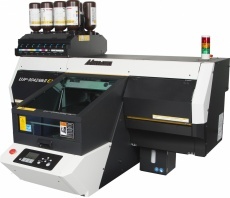 Kazuaki IKEDA, announced today the release of [ UJF-3042Mk II EX ] in July 2017, an EXTRA modelof [ UJF-3042Mk II ] of A3 sized UV inkjet printer available to complete by just one print setting of four steps – primer print of strong ink adhesiveness, white print of high print opacity, full color print of bright colorfulness and clear print of surface treatment. [ UJF-3042MkⅡEX ] is the EXTRA model of [ UJF-3042Mk II ], of which high productivity, excellent machine performance and beauty of print are reserved to upgrade the configuration from the 3 print heads to 4. This 4 print heads configuration enables an additional attachment of white, clear and primer ink with the full color (CMYK). The primer ink improves the paint adhesion of usual full color print and white ink print. The white ink realizes more vivid expression of print by full color on transparent or deep color media using together as the base color. The clear ink accompanies a sensitive design and a texture effect of matt, shine and premium feel. A current process of manual apply of primer and an extra job of surface treatment will be finished by one print setting of this new printer. Moreover, the availability of 2 bottles of white ink set on the [ UJF-3042MkⅡEX ] works for the higher density of white color in a short time. reduction of labor time and improvement of quality. Plus, the [ Status Indication Lamp] for check of printer status, the [ Vacuum table ] to fix a print substrate on the table, the [ Emergency switch ] to stop the machine operation in an emergency and the [ NCU ( Nozzle Check Unit ) ] of auto-detecting nozzle-clogging will be equipped with [ UJF-3042MkⅡEX ] of the optional items of [UJF-3042Mk II ] as the standard accessories. A compact but great printer of A3 size, [ UJF-3042MkⅡEX ] realizes the high value added print. It fires the imagination of creators and supports their business in terms of enhancement of work efficiency. Only one print setting realizes a full operation of primer application to clear surface treatment. 8 bottles of ink are settable to the [ UJF-3042MkⅡEX ] with 4 mounted print heads. In addition to the basic color set of CMYK, white, clear and primer ink are placed together to the printer. It enables to complete the 4 processes of the base treatment by the primer, the base print by the white, the full color print and the surface treatment by the clear by just one print setting. It leads not only to the value-added print also the work efficiency and the labor time reduction by the unification of the usual separated works like the primer and the surface coating into just one printer operation. While the ink adhesion with the material is not sufficient, applying the inkjet primer will help . The primer can be applied to the desired areas by ink-jetting. This feature retains the texture of the material while printing, which is not possible with manual primer application. The PR-200 available to [ UJF-3042MkII EX ] can be used on resin, glass and metal materials without affecting their texture and improve the ink bonding to the material originally the surface coated. The white ink with high opacity can enhances more vivid expression of full color to print together on a deep color or a transparent material as the base. Plus, max. 2 bottles of white ink can be attached to the printer to realize the high density white print in a short time with more opacity. With the [Glossy finish] for bright glossiness and the [Matt effect] for muted frosting, [Embossed print] by partial multiple layers, the high value-added print is available by the utilization of clear ink. It adds the glossiness, 3-D appearance, texture and premium feel. 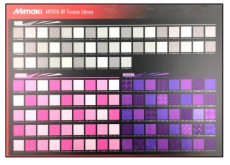 By installation of Mimaki RIP software 「RasterLink6」, the [ ARTISTA UV Texture Library ] of the equipment of 129 types of texture pattern will be registered to your PC as the swatch in Adobe Illustrator. Various textures are ready starting the [ BASIC ] pattern for elemental expression and the [ ARTISTIC ] pattern with floral-motif and symbols, the [ MODERN ] with visual effect. Expression of those textures with the clear ink can realize the print for more elaborated design. *1： The height(H) does not count the height of ink bottle. * Specifications, designs and dimensions stated in this catalogue may be subject to change without notice due to technical improvement etc.